The first annual meeting of the Board of Governors of the China-led Asian Infrastructure Investment Bank will be held in Beijing on June 25-26. Earlier in January 30 of the bank’s governors, representing over 74 per cent of the AIIB’s allocated capital, met in Beijing to approve the bank’s by-laws, code of conduct, and rules. BRICS members, China, India and Russia are the three largest shareholders, taking a 30.34 per cent, 8.52 per cent, 6.66 per cent stake, respectively. Their voting shares are calculated at 26.06 per cent, 7.5 per cent and 5.92 per cent. Indian Finance Minister Arun Jaitley, who represents India at the AIIB board of governors, will also attend the annual meet on Saturday. The AIIB will extend China’s financial reach and compete not only with the World Bank, but also with the Asian Development Bank, which is heavily dominated by Japan. China, however, has repeatedly stressed that the new bank is willing to work with other development lenders. There are more than 30 countries waiting to join the China-led AIIB, in addition to its 57 founding members, the bank’s president Jin Liqun said earlier this year. 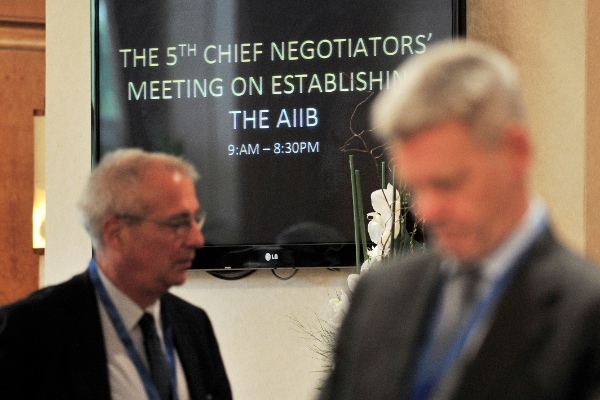 The US and Japan have not applied for the membership in the AIIB. The China-backed lender has 57 members including major allies of the US such as the UK, Australia, Germany, France and Italy. The bank was formally established in Beijing in December last year and started operation in January. The AIIB is one of three entities China is promoting, along with a joint $100 billion BRICS Development Bank and a $40 billion Silk Road Fund.